I made these desks quite a while ago and I am releasing the files to make them today. Very inexpensive to make and long lasting quality. These desks can also be taken apart and moved relatively easy. The computer desk features a lofted bed option but works great without it also. Fits all the monitors you might need and is very sturdy. 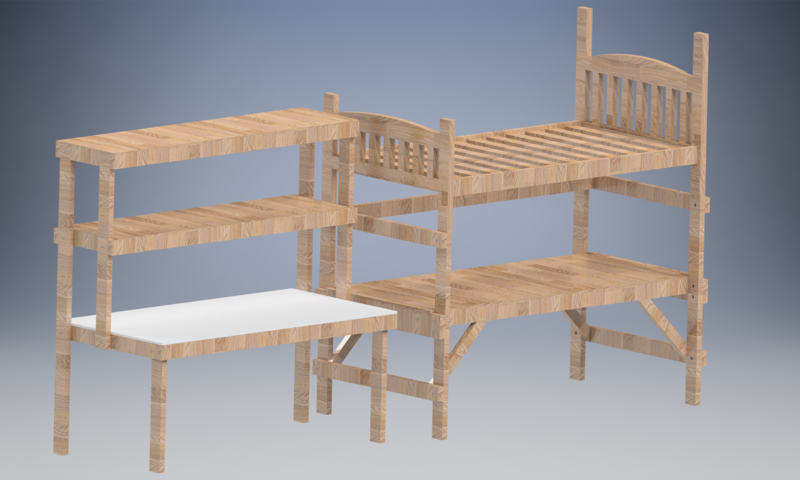 The workbench can fit full length “rack sized” equipment on the shelving, expanding options for electronic test setups. Like the computer desk, it is extremely sturdy holding many hundreds of pounds on the shelving. The equipment needed to make the desks are a chop saw (with 45-degree angle cuts), circular saw, sander, ratchet set, drill, drills, 1/4″-20 3″ long carriage bolts, nuts and washers, some type of wood varnish/stain.